Welcome to the Buffalo Stamps and Stuff Monday Idea. I was looking at all the new 2011 Silhouette Stamps that Hero Arts has in their collection (I don't have any yet) and I was wondering why we always ink up Silhouette stamps with black. So I set out to experiment with different ink colors. I used this Rubber Stampede The Magic of You (#3818F) stamp and inked it with Worn Lipstick Distress Ink. I also sponged the edges of the circle with the same ink, as well as the edges of the paper doily. The background paper is from Prima, Fairy Flora 6x6 stack. Love this stuff! 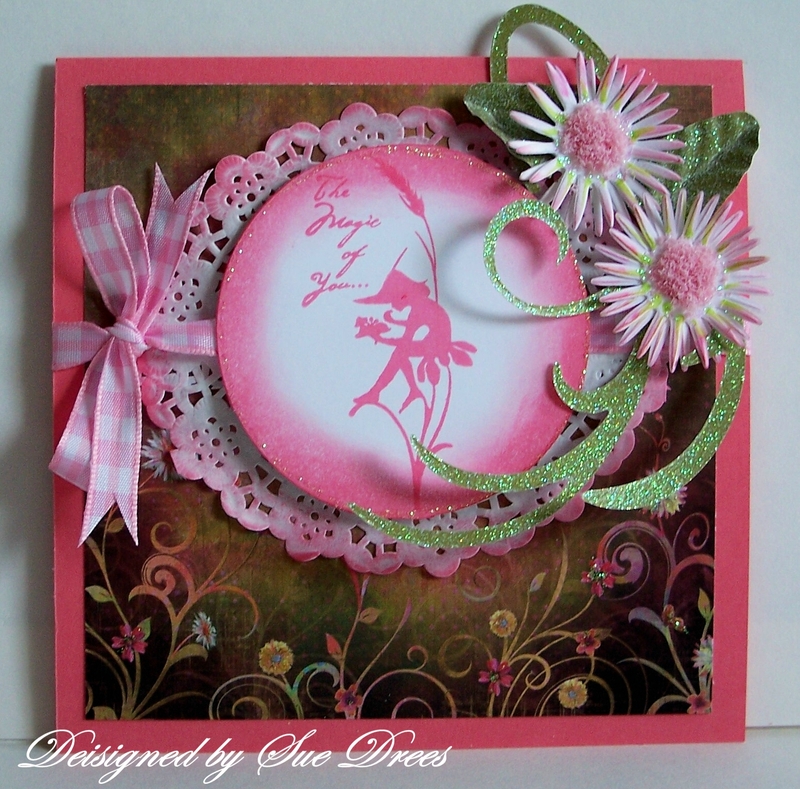 The daisies and the swirl were cut from separate Sizzix dies. The centers of the flowers were filled in with pink Flower Soft. and brighten the daisies. A gingham ribbon to finish it off. I cut the leaf shapes from scraps of the glitter green paper, then ran them through a crimper on an angle. 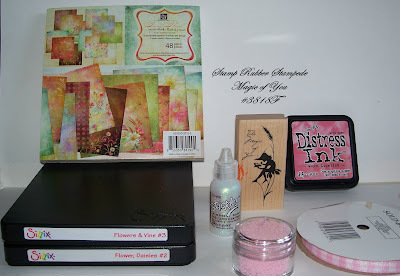 Try stamping a Silhouette stamp with a colored ink. I like how it turned out and it looked great in many colors that I tried. This is a great idea, Sue! I will try to stamp a sihouette in a color the next time that I use one. This turned out great, lovely card! Ooooh Sue - LOVE your pink silhouette!!! And those flowers and flourishes - fabulous!!! I'll be pulling my daisy die out soon! 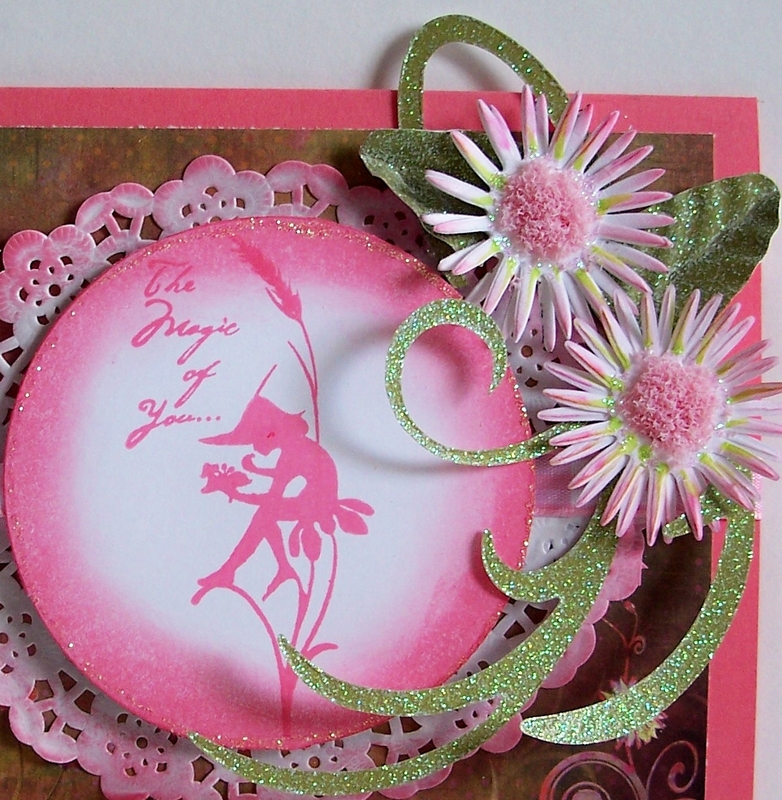 Oh so nice card, love colours ans the silhouette is superb ! gorgeous flowers and lovely silhouette. Fab sparkle and that DP is just awesome!!!!!!!! This is such a beautiful card...just love how you masterfully put it all together! Lovely and etheral! I certainly would have never thought of using a color other than black! Bravo!!! Awwww, it is beautiful Sue!!! 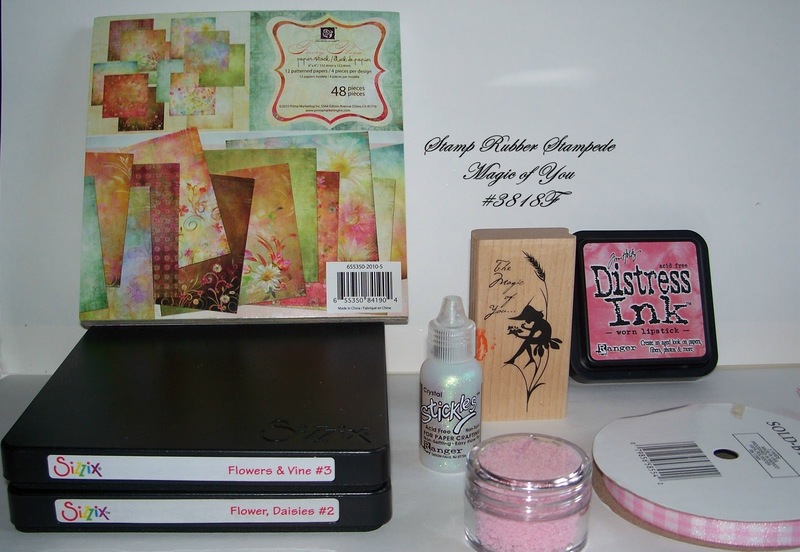 Gorgeous assortment of goodies you've used and that glitter sets off the silloutte beautifully!! P.S. My area of Kansas got its first blanket of snow this Sunday/Monday!!! you're right, I always reach for black...I really like this idea, thanks for sharing! Gorgeous flowers and that silhoutte looks gorgeous in pink - great idea.